Loos, Noel. 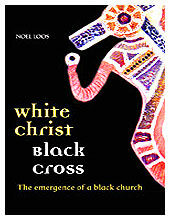 White Christ, Black Cross: The Emergence of a Black Church. Canberra: Aboriginal Studies Press, 2007, website. What was going on in Christian missions to indigenous Australians? This is one of the underlying questions raised by Noel Loos' book White Christ, Black Cross: The Emergence of a Black Church. He addresses this question through an exploration of the Anglican Church's indigenous outreach, with a particular focus on Yarrabah in northern Queensland and the work of the Anglican Board of Missions (ABM). This kind of detailed study of mission history is essential if we are to move beyond clichés about mission history and its effect on indigenous Australia. Too often, generic statements about missionaries colluding with colonialism and destroying indigenous cultures are presumed to say all that needs to be said about this aspect of contact history. On the other hand, some Christians can whitewash mission history, as though any injustice suffered was justified by the fact that people gained access to the saving Gospel of Christ. Both these positions call for a more discerning account of concrete mission histories for two reasons: to do justice to indigenous agency in the encounter with Christianity, so that indigenous people are not presented as mere victims; and to do justice to the ways in which the missionary agenda was not only parallel with that of other colonial forces, but also diverged from it. In Loos' book, we find the sort of case study that helps to offer this nuance. He shows how missionary attitudes, while very much culturally conditioned, were also, in some cases at least, counter-cultural. While not denying the view of many missionaries that indigenous peoples were only capable of being ‘civilised' to the level of the British working classes, he notes also the firm conviction as to their fundamental humanity. He points to the ABM's early awareness of the devastation caused by dispossession and of the responsibilities incumbent on those who benefited from this dispossession. A major character in Loos' story is Ernest Gribble, a veteran of a number of Anglican missions, who, despite a reputation for being an authoritarian mission superintendent, played a key role in uncovering the Forrest River massacres, leading to a Royal Commission investigation. Loos also offers a more nuanced picture of Aboriginal responses to missions, one which points to their active agency within the considerable limitations imposed on them. Some indigenous people discerned something of value in what was being offered and made choices about how they would engage with that offering. Loos shows this especially by tracing the history of Aboriginal leadership within the Anglican Church, from early leaders like James Noble, through a range of lay evangelists, to significant milestones such as the episcopal consecration of Bishop Arthur Malcolm as the first Aboriginal bishop in the Anglican Church. One point that Loos refers to only in passing requires further development. This is the area that philosopher-theologian Bernard Lonergan calls incarnate meaning — the meaning of a person or group or way of life. Mission studies tend to focus on two areas: the verbal communications of missionaries (what they said in their catechesis and preaching); and the social structures of mission life (how missionaries controlled indigenous life, as in the prohibition of local languages and rituals, or the creation of dormitories which separated children from their families). But for all ethnocentrism of the verbal communications, and all the destructiveness of the social control, there were also the missionaries themselves — their presence and the relationships they formed with the people. At various points, Loos shows the deep respect indigenous people had for at least some of the missionaries — people who lived with them for long periods of time, who maintained contact and relationship with them, who shared the hardships of mission life, who persevered with little support from their own churches and culture, and who gave witness, in fragile earthenware jars, of a treasure they wished to share with indigenous people. The tragedy, of course, is that these same people undermined this reality by various forms of collusion and paternalism. This book, though, ends on a note of hope, as Loos outlines the growth of a ‘black church' in which, out of a most ambivalent history, indigenous people emerge with a desire to continue to engage with Christ and to share his Gospel, not simply with their black sisters and brothers, but with the wider Australian Church and beyond. Isn't it ironic that parallels between past and present still seem to exist in that it remains the role of the many modern social agencies (vast majority were founded on, and remain committed to Christian principles) who dare to go where others won't (turn a blind eye) or dare not (ethnocentrism). Neither are the vast majority of Jo Public made aware of the Church's long time adherence to the ecumenical and internationally respected 'Golden Rule'. Whereby goods and services are provided to whomever they are needed irrespective of, and with great respect for the recipient’s faith, nationality, and culture. All of which is provided on a shoestring budget/deficit with very little public (government) money being invested in comparison to the social needs of the time. My own research and thesis concerning missions and indigenous people raises many questions about indigenous agency and the position of missionaries whose views ran counter to prevailing ideas. There were indigenous people who converted to Christianity and took up roles as preachers, holding services for both Aboriginal and white people around 1910 in NSW. John Gribble and son, Ernest were prepared to confront settler society with the consequences of settlement for Aboriginal people. It was of great cost to John, who died exhausted at the age of 46. In NSW there were the Aborigines Inland Mission and United Aborigines Mission both sending workers to live among Aboriignal people. Recent scholarship internationally is showing missionairies have been both marginalised and implicated in the settler-indigenous encounter world wide. Women played a vital role in this movement. It is a complex relationship which deserves deeper and further analysis. I look forward to reading Loos' book. This review makes very informative reading. It is interesting to see another perspective on this issue. For some years now I have been very annoyed by the patronising attitude of many "liberals", assuming that the Aborigines were tricked into converting and were not able to make a free choice - it is an "enlightening experience" when a white person finds "enlightenment" in one or another "spiritual movement" but this prerogative is not recognised that an Aboriginal person is capable of making. Obvious Loos' book gives a new perspective on this subject. Congratulations Robin, yours is a great insight and you've got five years of form to go with it. Is it possible to hypothesise that when Europeans were few in number in Australia, and the critical mass of people in our country was obviously represented by indignenous people, could it follow that aboriginal culture became a unifying force between aboriginals and Europeans thus giving us our unique national character. To paraphrase Evelyn Underhill: 'only an Australian knows what it is to be Australian and he knows only by being immersed in it'. Thanks, Robin, for reviewing this rather 'Anglican' book, keeping in view the much wider issues involved. You may be interested to know that James Noble is in the Calendar for Australian Anglicans (now described as 'pioneer Aboriginal deacon', November 25, d. 1941). Bp Arthur Malcolm's ministry has had great influence across all Australian Anglican traditions, and some of his prayers were included in A Prayer Book for Australia (1995). Over the summer I read Richard Broome's Aboriginal Victorians, and found (along with many other aspects) the sort of critical empathy with missionaries and Aboriginal Christians which I think you are encouraging. Now I'd better read Loos! I've been happily married to a Ngarrindjeri woman for more than 40 years and, although I'm an atheist, we've always been interested in the work of the missionary who set up her mission at Point McLeay, SA - George Taplin. In the '80s we read (and then we re-typed) his 20-year Journal (1859-1879), 600 pages of fascinating detail (available free on application). He was asked in 1860 at a Select Committee investigation how long he intended to stay with the Ngarrindjeri people. 'I hope to stay with them until I die,' he replied. And he did. He initiated the births, deaths and marriages records, a vital legacy. He initiated the school, farm, housing, medical service, ration system and a sort of Aboriginal advisory committee. Without him, I don't think the population in the region would have survived, the death rate from TB and measles and injuries was so high. Of course, he was (from an atheist's point of view) devoutly religious, but if he hadn't done the job, who would have? My mob, on the Left? No evidence anywhere in Australia of that happening, not in the nineteenth century. So I dips me lid to missionaries. Oh, and the missionary at Point McLeay attempted from the outset (like almost every missionary that I have read about) to teach the children in their own language, translated bits of the Gospel into it, wrote up a Grammar and, as far as I can tell, did nothing to discourage its use. The problem was that, already by 1860, many children were from elsewhere and couldn't understand Ngarrindjeri, but all children could understand English. The missionaries around Adelaide in the 1840s, those Lutherans around Lake Eyre (1866-1917), and the Presbyterians at Ernabella after 1935, also taught as much as they could in the local languages. And yes, often (one gets the feeling) they worked in opposition to pastoralists and governments. Certainly Taplin did. But that's another story. I welcome Robin Koning’s review and look forward to obtaining a copy of Noel Loos’s book and reading it. Having worked as a missionary with Aboriginal people for 20 years, lecturing in Aboriginal Studies, and recently completing a PhD thesis on Moravian Aboriginal Missions in Australia, I am aware of the many ill-informed comments made about Aboriginal missions. There were missions whose policies and practices were narrow and patronising and those of us who worked under more liberal policies were human and not immune from making mistakes. But the tendency to stereotype mission work has distorted much of the writing about Aboriginal mission history. A book I found helpful is Kenelm Burridge, In The Way: A Study, of Christian Missionary Endeavours. In evaluating the role of missions, three points should be kept in mind. Firstly, the bad policies and practices often reflected the wider prevailing views of the time. Secondly, some missionaries, accepting the common humanity of Aboriginal people, repudiated those prevailing ideas and worked to educate and train Aborigines despite predictions that they had no future. Thirdly, writers often fail to distinguish between missions run by churches and settlements and reserves administered by government boards. Critical reference is made to missionaries when in fact the settlement staff referred to were government employees. Good that such a book has been produced. I know that when I spent some time in Hermansberg, I pondered the complexity of what had occurred there from early days to the present. what about all the stuff the aboriginals have doen. the billions of dollars we spend on them. we provide housing and sewerage and they trash it. we provide them with a better chance at life, they abuse everything we have provided for them. why is this all about how aboriginals have suffered, why can't they move on and create a better life for themselves, and make something of their existence instead of waiting for the government to send them welfare packages to gain their vote? it's all a bit absurd to me. I Daniel Noble come from Yarrabah FNQ and is a direct descendant of Rev James Noble and a blood relative of Bishop Arthur Malcom. As i was reading this article I felt so proud that I am related to such two inspirational men. I am proud to acknowledge them as my rellies and that my family ties have made history. Thank God for my grandfathers missionary works in NT WA & Qld, and I am proud that the indigenous people of these areas are thankful that the word of God has been brought to them by an Aboriginal man. I sincerly admire grandad Arthur's achievements he has accomplished over the years, which has lead to his consecration as Bishop. Thank God for giving my community of Yarrabah both true and very inspirational men. Dear Robin, I am a direct descendant of the Reverend James Noble. He is my great grandfather. I am interested in any of his work that is not noted in public pages. He was a great man in my eyes and the eyes of my family. My great-grandmother is somewhat of a mystery and her legend is super-human. Could it be true she went undercover as a boy? Strange, but so likely to be true. Your Sincerely, Tab Saunders and on behalf of Rev. J. Noble and Angelina Noble's Descendents. Joe, that was an excellent comment! I have completed a “study” of the Gribble missionary family. They similarly ran their missions. You diary work sounds fascinating and an excellent project. Could I recommend Harris’s book “One Blood”? I would like to know more of Point Macleay. Sweeney Todd is a cautionary tale, but it's more than that. Todd's ultimatetragedy is that his all-consuming quest for revenge blinds him to thethings that could make him happy again. A new exhibition of compelling and confronting photographs captures the impact of natural disasters and other humanitarian emergencies, and the crucial role of Australian aid workers and volunteers in the initial response and longer term rebuilding process.